Surlingham is a lovely place, not far removed from Norwich but hidden away in the bend of the great, wide river. It feels far, far more remote than it is. Coming here in the 1940s, Arthur Mee bemoaned the fact that the setting of the church was spoilt by the aunt sallies of the petrol age, by which he meant the village petrol pumps, probably set up outside the old smithy: but they are long gone today, alas. We were heading back towards Norwich on a fairly dull afternoon in the late spring of 2008. We'd been out in the Lothingland peninsula, and by contrast this area was attractively rolling and wooded. But the humidity was heavy, the sky lowering to meet the ground, and we were barely an hour away from heavy rain. As we parked outside the graveyard, a woman was hurrying towards the gate. I asked her if she had just locked the church, and she smiled, and told us no, and that it was always open in daylight hours. "There's always a welcome here", she said. The rugged Norman round tower rises in a number of stages, as if it had telescoped out of the ground. There is a pretty later bell stage perched on the top. 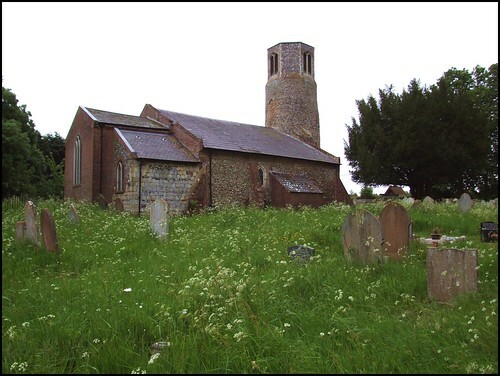 The north aisle makes an assymetric shape of the church behind it, but this is still a small church in an intimate graveyard. An unusual feature is that the chancel appears to have been completely rebuilt in the 18th century in an idiosyncratic manner. The east and south walls are in brick, but the north side is stone faced in what appears to be a deliberate attempt to make it look 'old', a kind of antiquarian folly. The north doorway was rebuilt in brick at the same time. The south doorway opens into a nave which is full of white light, a pretty interior, with a gallery at the west end which looks as if it might have been a layer of a wedding cake. By contrast, the 15th century font is like a melting cheese, with deep set reliefs in the traditional East Anglian manner. The green ceiling of the chancel and the wooden framed east window give it a rather jolly organic feel. All in all, properly Anglican, with a sense of being well-loved and cared for. Apart from the font, there are other relics of medieval days. John Alnwick was Priest here in the church's Catholic days (indeed, Mee points out that he was probably the first Priest to use the font when it was new) and he has a brass effigy in the chancel from about 1460. One of his successors is remembered by a rare chalice brass to the west. Both images did well to survive the Anglican reformation, and the puritans of a century later. Outside, the cow parsley to the east and north of the church was alive with flitting and stumbling bees, all busy collecting nectar. I wondered if they were descendants of the ones that John Alnwick would have known.